When King Henry VIII sent Charles to bring Mary back to England in late January 1515, he made the Duke promise that he would not propose to her. However once in France, Mary persuaded Charles to abandon this pledge. The couple wed in secret at the Hotel de Clugny on 3 March 1515 in the presence of just 10 people, among them was King Francis I. Technically, this was treason, as Charles Brandon had married a royal princess without King Henry’s consent. Thus, King Henry VIII was outraged, and the privy council urged that Charles should be imprisoned or executed. 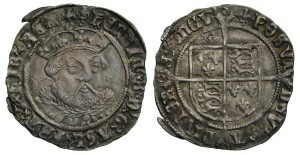 Because of the intervention of Thomas Wolsey, and King Henry’s affection for both his sister and Charles, the couple were given only a heavy fine. The fine was a payment of £24,000 to be paid to the King in yearly installments of £1000, as well as the whole of Mary’s dowry from King Louis XII of £200,000, together with her gold plate and jewels which had been given or promised to Mary by King Louis. 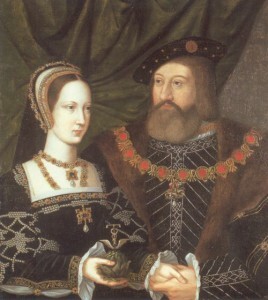 They married officially on 13 May 1515 at Greenwich Palace in the presence of King Henry VIII and his courtiers. Then in 1528, Charles secured a papal bull from Pope Clement VII legitimizing his marriage with Mary.